We all look forward to a well-deserved catch-up with the family over dinner. 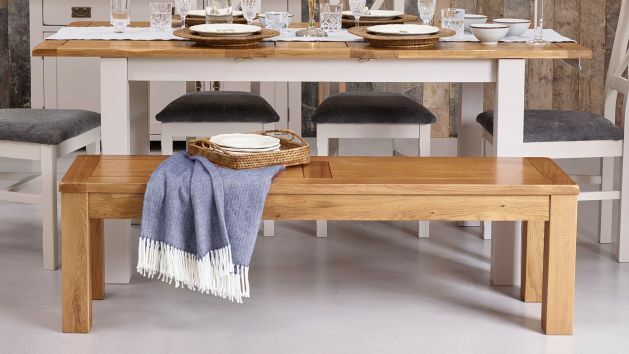 Our beautiful solid oak benches and stools are ideal for creating an intimate dining area that’s casual and relaxed. Our bespoke benches and stools come available in a range of sizes so you can find one that suits your space and match with our dining chairs. Made from the finest solid oak, they are built to stand the test of time and will serve as staple dining room seating for years to come. Wooden benches and stools are a great way to create a casual dining look and can also save on space in smaller rooms where having lots of dining chairs could look and feel cluttered. A dining table with a bench on either side creates a dining area that feels inviting and cosy when the family tucks in around the table. If you’re a fan of the mismatched look, place an oak dining bench seat or stools at one side of the table and incorporate chairs on the other. If you’re lucky enough to have a large low window in your dining room, place a dining bench against it and layer up with cushions to create a cosy seating area. You can find the perfect pairing of dining table and chairs with our dining set builder or look at our specially coordinated sets of dining table and chairs. Oak Furnitureland has a wide selection of stools and benches in varying sizes, so you can create a look that perfectly suits your dining room or kitchen-diner. For an on-trend look, place hanging pendants above your seating area for a style that really suits your furniture. The warm overhead glow will help to create a snug ambience that encourages socialising. Or try to create the same feel with floor and table lamps if you want something more flexible. All our benches and stools have been made from the finest A-grade solid wood to ensure longevity. For that reason, we recommend using our special clear wax polish to preserve and maintain the wood’s natural beauty over the long term. Take a look at our blog post for additional advice on dining room benches and seats. Our flexible furniture financing mean you can enjoy your dream dining bench and stools without having to worry about paying the full costs right away. If you purchase an item over £500, you can spread the payments over four years and if you make purchases over £3,500, you can look forward to interest-free credit over three years. All our items can be shipped for free and placed in your room of choice.